I know it is the least original statement on the planet, in December, to express surprise that the holiday season is coming up so quickly. I mean, what, we haven’t had 12 months’ worth of calendar preparation for this? But still, it does take me by surprise most years, especially this year since I had a big chunk of time taken up by a move & the transition aftermath. You forget that experiences like actually have to take up time in the calendar, you know? Let alone time required to get in some gift knitting. I think your brain offers you the brief period of denial about how little time you actually have to prepare for the holidays, as a sort of temporary coping mechanism. And man, I am really okay with temporary denial about knitting timelines as a coping mechanism, I have to say. Thank you, denial brain, for trying to help me out. I owe you one. In terms of decorating and cards-mailing I am actually pretty okay with being a bit behind schedule, except that this year I really was going to do a bunch of gift knitting. Everyone was going to get socks, you see. And actually a few people probably will still get socks, just not as many as i’d hoped. To assist me in this salvaging, I’ve decided the pair of Jaywalkers I’ve had on the needles for my purse knitting project are actually not for me, but they will be added to the gift pile. The colours are great and someone will enjoy them just as much as me if not more so, and I’ve got plenty of socks in my own sock drawer. Another thing I am reminding myself about is that the holidays are a great time for selfish knitting once the gift knitting (or general holiday preparation) is finished, so I’m going to ponder what my Christmas Day cast-on will be. It may even help to curb some of the start-itis I’m wrestling with, so that I don’t cast on four more projects between now and the holidays. I hope your holiday preparation – or lack thereof – is proceeding exactly how you would like it to, whatever pace that is. Have a great weekend ahead, knitter friends! Happy knitting, Glenna. I’m off to see my daughter at One of a Kind today, which is another clue that Christmas is approaching WAY faster than I had planned. I’ve been contimplating my Christmas Day cast on, too! It will be a relief to have these last knitted gifts finished…I always wait too long and then go nuts trying to get it all done. Kniting is not supposed to be stressful! Love your sox! I bought that yarn for the name (since it is my name – lol), but haven’t used it yet. Nice to see how it is knitting up. I had planned to make sox for several people, but since I am very, very new to sock knitting (only have made one pair) and not that great at it, no one is getting them. 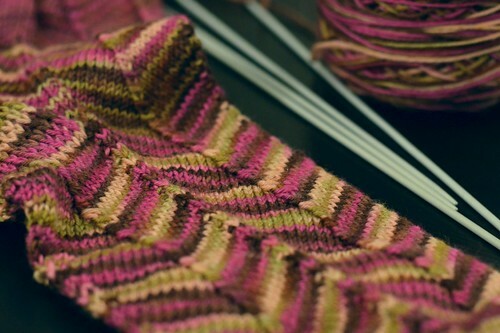 Maybe next year….Meanwhile, maybe I’ll plan to cast on a pair in the Vera colourway on Christmas day! Enoy your holiday. Like you, I’d been planning on knitting socks for everyone. Maybe we should start them now and have them ready for next year? Happy knitting! 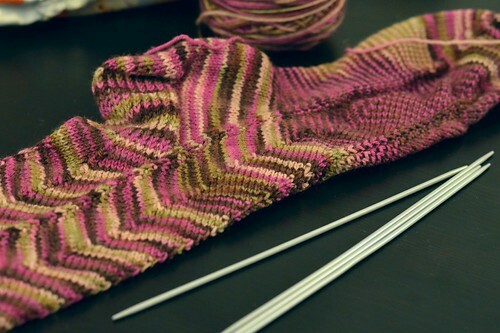 After a year of intense knitting for others, the idea of a selfish cast on sounds very appealing!